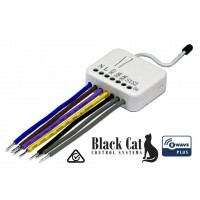 Black Cat Control Systems are leading Automation Importers of Z-Wave Plus, sub G, Wifi and Blue Tooth controllers. Black Cat Control Sytems are Certified Z-Wave Engineers, we seek out the best products that can be intergrated into Residential-Office and Commercial environments. Our ever increasing range now provides Switch Board Solutions which provide a professional solution to Automation giving professional results. We not only provide solutions in system design but also distribute the latest European switching designs in conjunction with TEM Australia. Our supply chain includes Distributors, Resellers & Installers and we welcome enquiries for Trade Sales (ABN required) from New Clients. All of our Z-Wave products are Z-Wave Plus (GEN5) and are Google Home and Alexa ready. Now available is the ZWBCHEM-AUS, the Z-Wave Plus Smart Home Energy Meter. Monitor your real time Energy usage and automate your home-office for optimum energy usage. Australia's only Z-Wave recessed Power Socket range. TEM Push Button Sets by Black Cat. 3M Sets are retrofittable into Australian Standard Plaster clip or wall box. Dare to be different with TEM and explore the different Surround shapes tht are available. Shipment time 2 weeks. DoorBird IP Video Door Station D2103V, Brushed Stainless Steel, Flush-mo.. Shipment time 2 weeks DoorBird IP Video Door Station D2101KV for single family homes, Brushed Sta.. Shipment time 2 weeks. DoorBird IP Video Door Station D2102V, Brushed Stainless Steel, Flush-mo..
CONNECTOR KS HDMI - KS keystone fixing standard - only in combination with KM50 Adaptor (supplied).. The IA50 RC Bypass Module is used to eliminate flickering and disturbances in the operation of LED a.. The Cat’s Eye Door Window Sensor ZWBCCEDS-AUS is a Z-WaveTM Plus product that supports Security and ..
Smart Home Control Single Socket​ Control your appliances with this Z-Wave Plus enabled wall s..
HS3 & HS3PRO Smart Home Automation Software HS3 is the industry standard for flexible, powerfu.. Shipment time 2 weeks. DoorBird IP Video Door Station D101S, Polycarbonate housing, Strato-Silver E.. The Cat’s Eye PIR Sensor ZWBC21S-AUS has PIR and luminosity functions built in, these are all based.. This slim multisensor has PIR, door/window, temperature and illumination sensors. 4 sensors functi..